One week into 2014 and, if you’ve set a (or some) resolution(s) you should be 7 days in. Just curious…How’s that going for you?! Statistics on sticking to New Years resolutions are terrible! Depending on what source you look at – the success rate can be only 5-15%. Come on! we can do better than that! Actually starting a task can be the hardest part – I get it – but personally, I don’t understand why people wait until Jan 1. to begin any goal. 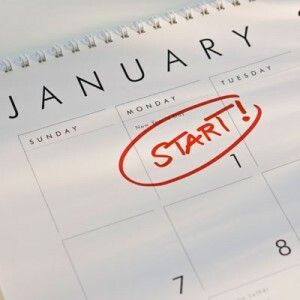 Goal-achieving can be hard enough without letting the start of the Gregorian Calendar be what pushes your start button. I believe that using the calendar to inspire action is like using a false friend for a buddy; in a pinch – will they go out of their way to back you up when you need it? You want to start something? Start it! You want to change something? Change it! As you progress it should feel as if you are making choices – not sacrifices. The more involvement you have in the initial planning, instigation and performance of a goal the more motivation, commitment and accountability you’ll have as you progress along your goal-achieving path. When that is the case, as you progress it should feel as if you are making choices that will help achieve your goal – not that you are making sacrifices that will ‘ruin your day’. This isn’t exclusive to adults. Too often I hear stories where parents have, with best intentions, taken care of all of the planning, the start date and even a lot of the ‘tricky’ or more challenging elements of a goal/task that belongs to their child and then they wonder why their child has no commitment to it. A lot of what I do as a speaker and mentor is about helping people stay connected to their goals and to embrace the natural ups and downs that come with applying their ambition. My book, The Power of More; How Small Steps Help Us Achieve Big Goals is designed to help everyone stick to and achieve their goals, regardless of the goal’s size. I can’t help but think that it’s the perfect time of year for me to share an excerpt or two. I appreciate every copy that is purchased. Thank you. The following are two short excerpts from The Power of More; How Small Steps Help Us Achieve Big Goals. Published by Greystone Books. Widely available in book and ebook formats. If you’ve set yourself a big goal, or a long-term one, sooner or later it’s going to get difficult. There will be mental, physical, and emotional challenges every step of the way. If the goal is a passion goal, something you need to do, then it doesn’t matter what the challenge is: you will remain hungry to try. Your ambition and drive will continue to push you to learn and do more. Your passion won’t allow you to be content with your current status. Some goals need a lot of energy and ambition, others just a little. A passion goal can sometimes fade into something you just want, or maybe you realize it’s more someone else’s goal than your own. Either way, the natural evolution for many goals is that at some point you will run out of the ambition needed to keep you spinning for more. When your goal becomes something you barely even want to do, it is easy to notice everything you are missing out on—the sacrifices. It’s more likely to feel like a burden. This is another reason why it is so important, when setting goals, that you be clear why you are (re)setting, and accepting, a goal. Is it really your goal? Are you prepared to embrace it as your goal? Even easy goals require some ambition and effort, and that’s going to have to be applied by you. It’s not likely that you’ll know all of the details at the outset, but it’s important to have some idea of what you are getting yourself into. If you willingly choose to go forward, then the challenges that will follow will be easier to embrace. In the absence of choice, when challenges pile up, you can become bitter about all that you aren’t doing—your sacrifices—instead of being engaged by the effort and rewards of what you have chosen to do. If the goal is simply something you want, then your level of confidence plays a bigger role. Because confidence naturally waxes and wanes, when you are setting your goal, you need to develop a specific vision about what is important to you. When your level of confidence is low, you tend to lose some of your ambition. You then question how hard a bit more might be rather than paying attention to how much you want to achieve your goal. The thought of the effort blocks the connection to the goal. Are you willing to risk disappointment or failure? If you know how much you want to achieve the goal, and even why you want it, you may be willing to give a bit more. People often use past failures to put limits on themselves. But failing once does not mean failing forever. Anything worthwhile is likely going to be hard. Your previous expe- riences should be used as a tool to help you understand the challenges you now face, not as a weapon to discourage you from trying. The first step to achieving your goal is developing a plan that outlines the path you will follow to achieve your dream. That path is your task. The second thing you need to convert those dreams into goals and achieve them is ambition. It is the magic that actually starts you moving; everything is still just an idea until you apply ambition and actually try. Ambition drives us and unsettles us. We watch, learn, listen, and respond based on our ambition. It compels us to try harder or try more. Having dreams and creating goals for ourselves is fun, but it’s not until we start applying our ambition to them that they become real and we start moving toward achievement. Some people are very ambitious; others, not so much. That’s just part of what makes us who we are. The amount of ambition applied to a goal determines how driven and hungry to improve and achieve we are—or aren’t. Big goals require big doses of ambition, but ambition can also be applied to goals in small, conservative doses. Imagine that we have our own pot of ambition and that we can choose how we want to spread it around. Do we put it all toward just one or two goals? Or do we multi-task and spread it among many? Again, that is up to each individual and makes each of us who we are. When it comes to ambition, there is no right or wrong. So why is setting a path to achieve your goals important? As Yogi Berra said, “If you don’t know where you are going, you’ll end up someplace else.” And I’ll add—or nowhere at all. It’s easier to apply your ambition to the goal-setting path, which is something you can actually work on, instead of the final goal. I’ve seen too many people who are frustrated because they want to do or be something—but they haven’t taken the time to figure out what or how. I had a path; I knew my task. The first day I took a learn- to-row class, my dream became my goal. The number of actual steps required to achieve each of my initial steps grew exponentially as I went along my path. There were levels of club teams, levels of national teams, and levels of performance on the world and Olympic stage to master. The complexity of technique, improved fitness, advanced strategy, team selection and politics, life balance, health maintenance, and stress management was unimaginable to me as I began. Which is just as well, because had I known the size of the task, it could very well have discouraged me from ever starting. When creating a path to achieve any goal, it is not immediately necessary to know the details of the last steps. Chances are, by the time you get close to achieving the goal, you will have had to adjust and update your path numerous times. What you do need when creating the path is to be very clear about your first step, the task that you need to work on today. As you progress, you will learn the details for the steps required in the future. This entry was posted in What I'm thinking (Thoughts and opinions) and tagged goal setting, New Years Resolutions, Power of More by Marnie. Bookmark the permalink.